Editor James Lowder shaped Worlds of Their Own around a very simple premise: you might know the writers featured in the anthology for their franchise fiction (such as Forgotten Realms or Warhammer Fantasy), but just you wait until you read fiction set in their own worlds. Individually, each story wields the force of Sigmar’s hammer, but it is the collection as whole that feels like a Realms Shaking Event. “In the daily whirl of wordsmithing, Jim Lowder is a superb editor,” says Ed Greenwood, creator of the Forgotten Realms campaign setting and author of The Band of Four novels, and, more recently, the Falconfar Saga and Niflheim novels. “He knows when to correct grammar and (the rare times) when to stand back and let the story needs override pedantic details, he remains cool and calm during last-minute ‘rush jobs,’ and he has the vital editorial knack of being able to see the overall shape of a story, and how to make it clearer and more effective. Shortly after the publisher, Paizo, announced the final table contents for Worlds of Their Own, I spoke with Lowder about how the collection came about, the editing process, and the differences between writing shared world and creator-owned fiction. Jones: How did Worlds of Their Own come about? Lowder: For several years I’d been mulling over a possible collection of creator-owned short stories by writers known for their shared world fiction. My publishing background includes credits as an editor and author for such franchises as the Forgotten Realms, Ravenloft, and Tales From the Crypt, but also a long list of projects unconnected to shared worlds. The same is true for many authors known for their franchise fiction. They often publish stories or novels for which they control the rights, though these publications tend to get a lot less attention than their shared world work. So I knew what I wanted the anthology to encompass; I just hadn’t gotten around to pitching it to anyone. The subject of the anthology came up during that discussion, and we quickly agreed that the types of stories I envisioned including in the book would fit nicely with the “pulpy” adventure fantasy and SF already scheduled for Planet Stories. The anthology had the additional advantage of featuring authors familiar to Paizo’s readership. The subscribers to Paizo’s excellent run of Dragon and Dungeon magazine, as well as the audience for their new Pathfinder roleplaying game material, would be well acquainted with the writers working in such fiction franchises as Dragonlance or Warhammer Fantasy or BattleTech. But they probably hadn’t seen most of the creator-owned stories the anthology would showcase. When the subject of potential titles for the anthology as a whole came up, it became quite clear to me and to Erik that we were in sync on the project. My working title for the book had been Worlds of Their Own from the start, though I did not mention that title to Erik right away. A half-dozen or so e-mails into the discussion, Erik noted that he had come up with a title he thought would be great for the book: Worlds of Their Own. Erik and I got together in person a few weeks later, at the 2007 Gen Con Game Fair, and hammered out the details on the contract. We created a wish list of authors to invite and established deadlines. We left Gen Con that year with the project already underway. Jones: So you started with certain authors in mind, but not necessarily specific stories? Lowder: I started with a list of eight or ten authors I knew would make the book interesting and draw reader attention, and invited them to submit stories. From there I queried a much larger group of writers, some of whom I’d worked with before, others whose work I knew, but who hadn’t participated in any of my other editing projects. Most of the authors submitted several stories for me to consider. I requested specific stories from a few writers, pieces I’d read before and liked, or stories set in specific worlds, like “Mather’s Blood,” a Demon Wars tale from R.A. Salvatore. “Mather’s Blood” was a good choice because it introduces readers to Bob’s Demon Wars setting, but also contains many of the stylistic and thematic elements—vivid battle scenes, outsider heroes—that readers love about his Forgotten Realms books. On the other hand, “Keeping Score” was my introduction to Mike Stackpole’s Purgatory Station universe, so I wouldn’t have known to request it. 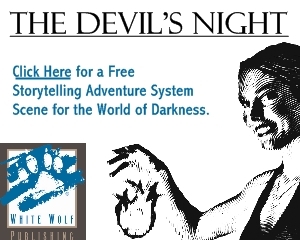 After reading it for the first time, however, I immediately went to his web site (www.stormwolf.com) to access some of the other Purgatory Station stories he has posted there. I think readers of Worlds of Their Own will do the same. Jones: Were there any surprises? Any authors whose creator-owned worlds were nothing like what you expected? Lowder: Some of the stories in Worlds of Their Own are radically different from the shared world fiction the authors have published. The most striking example is Richard E. Dansky’s “The Wisdom of Nightingales.” Richard’s franchise work includes a lot of great, but very grim material for White Wolf’s World of Darkness setting, yet “Nightingales” is a charming story much more akin to a fairy tale than a horror yarn. Even the pieces in the anthology that are similar in tone or style to the writers’ franchise work contain plot elements or bits of characterization or simply word choice that would have been problematic or even impossible were the stories not creator owned. For example, Paul S. Kemp’s contribution is similar in tone to his Ervis Cale stories, but the language is more adult in places. Ed Greenwood’s story is a swashbuckling, pulp-influenced adventure yarn populated with sky pirates and menaced princesses. It’s very much in keeping with the type of fiction he’s written for series like the Forgotten Realms, though a bit spicier in places than some shared worlds would allow. All the authors have been published before, with at least a few novels to their credit. Whether a reader knows a particular writer’s work well or not will usually depend upon what shared world series he or she follows. That said, I think the stories by Greg Stolze, Will McDermott, and Richard Dansky will surprise people the most. Readers will be struck by the notable differences in tone, style, and content between their stories in Worlds of Their Own and their franchise contributions to the World of Darkness or Necromunda. Jones: What is the darkest story in the collection? Lowder: There are several really dark stories: Nancy Varian’s ‘The Oaths of Gods,” William King’s “The Guardian of the Dawn,” Paul Kemp’s “Confession,” and my own “The Unquiet Dreams of Cingris the Stout.” Tough to say which is the darkest, but all four lean noticeably toward horror. Jones: Do you always include one of your own stories in the anthologies you edit? Lowder: Typically, no. 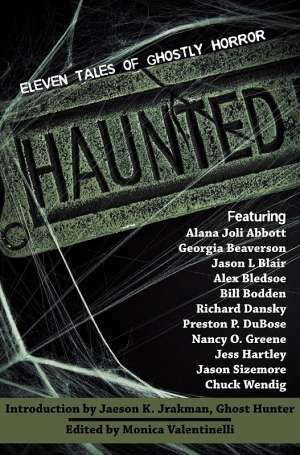 I’ve put together a dozen anthologies and have stories in only three or four of them. Sometimes publishers ask me to contribute as a writer when I pitch an anthology project. That’s what happened with Worlds of Their Own. I was honored to be asked and am thrilled to have a story in the book, but in general I try to keep the two roles—author and editor—distinct. In those instances when an anthology I’m editing includes something I wrote, I work with an editor at the publishing house, someone who can provide feedback on my story and make certain it’s up to par with the rest of the book. I am very critical of my own writing, but it’s always good to have a more objective opinion. Jones: You’ve done some really powerful collections in the past, especially The Book of All Flesh (Eden Studios, 2001) and the recent Astounding Hero Tales (Hero Games, 2007). But, that said, Worlds of Their Own might be your best anthology yet. Lowder: I’m pleased with how the book turned out, but it’s hard for me to compare it to my other anthologies. Each has its own identity. Editing an anthology is like creating a mosaic, a larger artistic statement composed of many discreet tales. Story selection and content order can lend the individual works additional meaning, so I try to suggest resonances and dissonances through juxtaposition, as in Sergei Eisenstein’s montage theory of film editing. Structuring the contents for overall pacing, impact, and variety is very important, too. A lot of that editorial work is invisible to the average reader, but if I’ve done my job as an anthologist well, that reader will finish the book and come away feeling that it’s a collection of tales that belongs together. Jones: How much of the anthology process is intuitive? Lowder: When ordering the stories I try to balance organic creative and mechanical structuring concerns. Some stories dovetail nicely because they just “feel right” when I read them together. But I may also link or separate stories because of their length, setting, or some other structural component. You probably don’t want the three longest stories set together. If you have only two stories in the book with first-person narrators, they likely need to be separated. But these aren’t inflexible or formal rules. If those two first-person stories resonate nicely, you could present them consecutively. Sometimes the links are subtle—one story in Worlds ends with a character falling asleep, while the next opens with a character in the middle of a nightmare. Other times, the sequence is ruled by pacing, so that an action story is followed by a more contemplative character study. There are all sorts of ways to make the anthology hang together as more than simply a random sequence of tales. I usually shuffle an anthology’s story order at least a dozen times as I’m putting the book together. For Worlds of Their Own, the last reordering occurred as I was making my final copy-edit pass, a couple days before I turned the final file over to Paizo. As I was reading the anthology for that last pass, I realized that I had placed two stories that shared a similar setting—a fantasy-tinged Dark Ages Europe—very close together. I found a new place for one of those tales, but that decision meant shifting a third story, because the new location of the Dark Ages tale left two first-person narratives back-to-back and clashing. In the end, the rearranging paid off. Making those last minute moves addressed the setting issue I had discovered, but looking at the contents again made me aware of some thematic links between three other stories—all, in one way or another, dealing with the idea of corruption. So those three ended up together, in a way that read quite nicely. Jones: You start Worlds of Their Own with R. A. Salvatore and Michael A. Stackpole. And you start the stories in Astounding Hero Tales with Lester Dent and Will Murray, all of whom are “big names.” Does name recognition influence story order? Is there something that makes certain stories openers or closers? Lowder: Every anthologist approaches this a little differently, and I don’t follow hard and fast rules between books, but you have indeed caught a pattern shared by the line ups for Worlds of Their Own and Astounding Hero Tales. For both books, the first and last stories are penned by the most widely recognized authors. But several writers of equal, or nearly equal stature can be found scattered throughout the anthology. Ideally, the book will have a nice mix of writers familiar to the audience and others that will be discoveries. The chance that I’ll come across something new and surprising is a big reason I enjoy editing or simply reading anthologies. And a deft editor will pace the table of contents with that surprise factor in mind. After the first few stories set the baseline for the types of tales the book will showcase, a well-paced anthology, for me, will include some “curveballs,” stories that are unlike any others, to keep readers on their toes. But the “put-your-big-names-first-and-last” approach isn’t the only way to structure things. The three zombie fiction anthologies I edited for Eden Studios feature first and last stories selected largely for their ability to open or close the books as if they were first and last chapters. The marquee value of the authors’ names was a secondary concern with those particular anthologies. Jones: One of the ideas at the heart of this anthology in general and your introduction in particular is the difference between writing in creator owned and shared worlds. Lowder: It’s a subject I’ve thought about a lot during my career. With a creator-owned project, the writer gets much more control. That’s the most obvious and important difference from a shared world assignment. And that control allows a writer to take more risks with the storytelling. It’s not impossible for a really enlightened editor or franchise owner to allow an author to do something wild and inventive with a shared world, but it’s much easier for a writer to create a surprising or personal work when he or she is calling the shots. 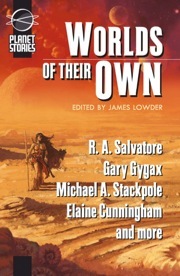 Until Worlds of Their Own, the Planet Stories line has focused on reprints of fiction written by the pulp writers of the past, such as Robert E. Howard, C. L. Moore, Henry Kuttner, and Leigh Brackett. Pre-Order Worlds of Their Own at Amazon.com. James Lowder has worked extensively on both sides of the editorial blotter. His novels include the bestsellers Prince of Lies and Knight of the Black Rose, short fiction for such anthologies as Truth Until Paradox and Shadows Over Baker Street, and comic book scripts for DC, Devil’s Due, Moonstone, Desperado, and the city of Boston. As an editor, he’s directed book lines or series for TSR, Green Knight Publishing, CDS Books, and Devil’s Due, and has helmed more than ten critically acclaimed anthologies, including The Book of All Flesh, Astounding Hero Tales, and Hobby Games: The 100 Best. He’s been a finalist for the International Horror Guild Award and the Stoker Award, and is a two-time Origins Award winner. Visit www.jameslowder.com for more information. Jeremy L. C. Jones is a freelance writer, editor, and part-time English professor living in Spartanburg, SC. He writes a weekly book column for the Spartanburg Herald-Journal and contributes regularly to newspapers, magazines, and online venues. Mostly, he spends his days reading too many books, asking too many questions, and telling too many stories.